James Dietz Handsigned and Numbered Limited Edition Print:"Le Autograph"
Size: 20" x 24 3/4"
About the Art: Planes are just proving themselves; they are fast and dependable. 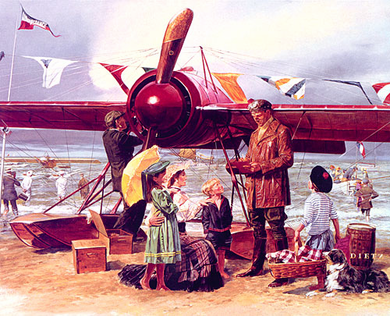 We admire the shiny red "Deperdussin" and vie for attention of its pilot, an American. He's so daring, so exciting, so adventerous. He's the winner today, and children and glamorous women alike yearn for his autograph!